1. Kakonjuka Set, $79.00 - Features an age-defying serum-like toner, milky booster and hydrating cream with six Asian botanicals. 2. Designing Pencil Eyebrow, $9.50 - Gently fills in eyebrows for a fuller look and conditions with olive oil, vitamin E and hydrating squalane. 3. 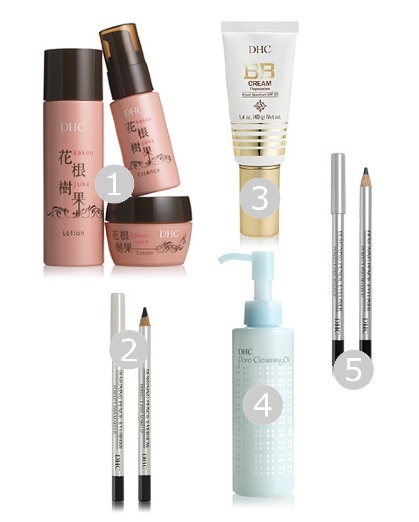 BB Cream, $45.00 - All-in-one beauty balm hydrates, primes, covers and protects with SPF 20. Available in two shades. 4. Pore Cleansing Oil, $31.00 - Makeup remover features nine emollient and antioxidant botanical oils, with a natural grapefruit scent. Velvety-rich serum-like oil loosens pore-clogging dirt, cosmetics and excess sebum, and deep cleans pores. 5. Designing Pencil Eyeliner, $9.50 - Eyeliner pencils in two natural shades and two vivid colors. Conditions with olive oil, vitamin E and hydrating squalane.